Do you wish to ride horses more than you do, avoid certain situations such as trail riding, or avoid riding in groups because of fear? Are you afraid of horses altogether? You're not alone. One bad experience or even playing out the scenario of a bad experience in your head repeatedly can lead to fear of riding. It's something many people deal with, and this fear isn't just "show jitters". Riding fear, or "losing your nerve" as some people call it, is a very strong emotion. It's also heartbreaking, as you look at your horse in the field or see your friends ride off and have fun without you. Riding is a hazardous sport, so caution makes sense. However, if you find your caution turning into an irrational fear, it's time to take action. It's important to understand how horses think and how they read us. If you are feeling fear, they will read your body language and become fearful too. A ​2006 study by the University of Guelph found that horses picked up their rider's fear and became more fearful themselves. This study backs up what horsemen have known for centuries. By riding scared, you could be compounding your problem by making your horse scared, too. Visualization is a technique used by athletes of every type. Chances are if you've got confidence problems, your visualization goes something like this: I'll get on my horse who is probably in a bad mood, and someone will drag a tarp across the barnyard. Then my horse will spook, I'll get bucked off, the ambulance will come, and I'll spend months in traction and rehabilitation. The reality, of course, is that your horse is relaxed, there's no one else around, no tarps are in sight, and all of this is happening inside your head and nowhere else. Learning how to visualize correctly means you'll be able to see how your ride will go and end with a satisfying feeling of accomplishment. Breathing exercises can also help, both on and off the horse. Hypnosis is somewhat like visualization as you listen to a voice that helps you first reach a deep state of relaxation, then gives positive messages about riding confidently. There are several sources for hypnosis recordings that you can purchase such as Basic Relaxation for the Equestrian Self Hypnosis, or Sharon Shinwell's Hacking with Confidence. Alternatively, you can make your own. An excellent book for stress problems of all types is The Relaxation and Stress Relief Workbook which gives instructions for creating your own hypnosis script. Not everyone who lacks confidence is a beginner rider. However, if you are, one of the most important things you can do to increase your confidence is improve your riding skills. Learning how to stop a spook before it happens, do emergency stops and dismounts, and how to improve your balance and seat will help you gain confidence. A riding instructor who understands how to deal with riding fear and doesn't push you beyond your capabilities is a must when you are working to gain confidence. You're not going to feel confident if you are scared of both your instructor and your horse. Overcoming fear can require small steps, each building on the others to increase your confidence. This means riding a horse you feel comfortable on, in an environment you are comfortable in. 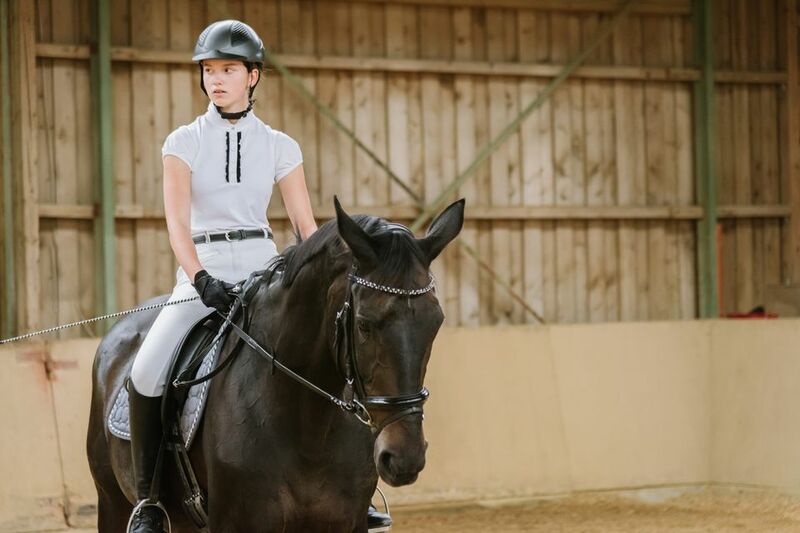 Although you may be anxious to get back out on the trail or the cross-country course, you may want to build riding skills and confidence in the ring or arena first. Your first steps may be riding a few yards down the trail, or riding a loop around that first jump on the cross-country course. Just as you would chunk down a scary situation for your horse to handle if it was scared, break your goals into smaller pieces. Once fear takes root, it can be very difficult to eradicate it. The help of a sports psychologist may help you work through your fear. A sports psychologist is trained to help people with performance anxiety and confidence problems. This can be especially useful if your fear stems from a very bad fall or injury. If your fear is severe but you are a very skilled rider who has lost confidence, anti-anxiety medication may also be helpful in the short term. A professional can help you determine if this is appropriate.